A high-quality and versatile keytar/ vocoder that looks and sounds great. Highly recommended. Wide range of MicroKorg XL derived sounds. Slimkey three-quarter size keyboard with two ribbon controllers. Well built, intuitive and nicely balanced for strutting around on stage! Missing a short ribbon mode to allow pitch and modulation simultaneously. Love them or loathe them, keytars are back with a vengeance. We take a look at powerful new update of Korg's classic RK100 synth, the RK100S. As much as some folks find the whole concept cheesy, keytars do serve a very important role in freeing up keyboardists from their static rigs. Whenever this writer straps on a Yamaha DX100 at a gig, it always provokes a great reaction and being free to roam the stage also allows you to showcase a more exuberant side to your playing. It's always fun picking a funky saw lead and letting rip Herbie Hancock style too! Perhaps we're getting a little too excited here but, coming back down to earth for a second, we're glad Korg has resurrected the RK (Remote Keyboard) line and, certainly on specs alone, the RK100S looks like a very powerful machine that totally eclipses the original RK100. The battery power-able RK100S is without doubt the best looking keytar out there currently and for that reason alone it's probably going to sell nicely. The white model Korg loaned to us for the review looks particularly sleek but the black and red models look stunning too and, for an additional bit of eye candy, the A to H favourite sound buttons also work as a level meter/arppegiator display too. However, looks are just one part of the appeal so how does the rest stack up quality wise? "The RK100S feels solid throughout like a performance/gigging instrument should"
Well, the RK100S feels solid throughout like a performance/gigging instrument should and it generally feels a lot sturdier than its all-plastic competitors. The main body is built from wood, which is painted and clear coated (the finish is just like a painted electric guitar body), whilst the control surface area is made from hard black plastic with red/green backlit translucent plastic buttons. What's great about the wooden body is that it's surprisingly light to wear and very nicely balanced, plus it will age much like a guitar too - a few years down the line it will no doubt feel a little more 'personalised' once a few battle scars appear! Now onto the playability. The three-octave, velocity sensitive keyboard (no aftertouch) is exactly the same as the one found on the MS-20 mini, though aftertouch would have really helped here for modulation duties as there's no dedicated mod/pitch wheels (note that the £165 Alesis Vortex includes aftertouch so we think it's fair to expect it for almost £700). This aside, though some people may lament the loss of full-size keys, the three-quarter size slimline keys work perfectly for a keytar - they ensure the whole package remains compact and they're super-fast to play too, which is what you want in an instrument designed for showing off on! More importantly, it's much easier to span a wider range of notes using smaller keys such as these. Plus the smaller span also means less stretching and jumping about the keyboard, which helps to take the strain off your back, arms and hands - full-size key keytars can literally be a pain in this respect and can be quite awkward to play. "Unlike the 1984 RK100, which was just a controller with no onboard sounds, the RK100S features 200 user-writeable sounds"
Unlike the similar looking original 1984 RK100, which was just a controller with no onboard sounds, the RK100S features 200 user-writeable sounds plus 17 high-quality master FX (two available per program). One thing to be aware of is that there's no direct/deep editing of the sounds from the front panel (though there are two ribbons for live tweaks), so deep editing is done via the intuitive USB PC/MAC editor which seems like a fair compromise and keeps the front panel streamlined and performance orientated. The RK100S's sounds are all based on the MicroKorg XL's sound engine and patches are also interchangeable between the units, which is great. As there's a powerful MMT modelling engine plus samples and DWGS waves onboard, with judicious programming the RK100S can cover a lot of sonic territory, though if you feel the three-octave keyboard is too restrictive for playing pianos and strings on, you can always MIDI-up another synth-action or weighted controller board - just keep in mind the maximum polyphony is eight notes. The presets are mostly suited to contemporary electronica with phat analogue basses and Trance-style leads but there's some lovely wide pads too and classic sounds from the Korg M1. There's also a decent 16-band vocoder that can be fully edited using the editor - simply connect a mic to the audio input, select a vocoder patch and fire away! Further to this, all the major sound-shaping parameters that you'd want to access (such as filters, envelopes, LFOs and vocoder controls) can be assigned a MIDI CC in the editor, so you can easily assign the long ribbon or an external controller to the CCs you use most. It's also handy that the RK100S is duo-timbral so you can address each sound from a different MIDI channel and program two-way splits and layers - it really is more powerful than you'd think on first glance. Finally, there's a nifty little arpeggiator with dedicated step mode - it can be assigned to each layer/split part independently and within the editor you can switch the eight arp steps on/ off plus tweak the arp length, range, swing, latch, gate time and key sync, plus there are six playback modes too. It's pretty comprehensive. 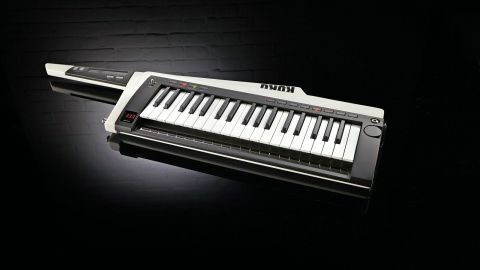 To sum up, the RK100S is in essence a tweaked MicroKorg XL in a sleek keytar body with two ribbon controllers and with all its deeper editable parameters hidden in the editing software. It's not cheap but it has the best sounding synth engine in its class and also looks great. The only thing missing is a short ribbon mode to allow pitch and modulation simultaneously (perhaps this can be added in an OS update? ), but otherwise it's a killer keytar!